An iconic sporting moment captured on video. 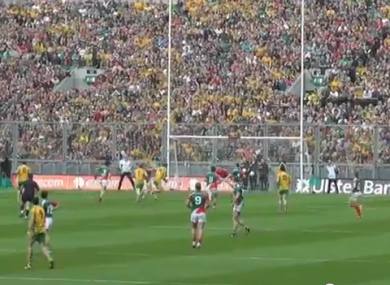 What: Michael Murphy’s goal in the All-Ireland Football Final. Where: Lower Cussack, Section 312, Row FF. How’d you get the footage? I was one of the lucky people to get a ticket for the game. My seat was in the lower Cussack, and was almost the same place that I was for the Kerry quarter-final match six weeks previous to the final. It is a great vantage point to see all the action of a match and the movement all over the field. I was very surprised at the number of Donegal supporters who managed to get tickets for the game, as the stadium seemed to be 60% Donegal people. It was a surreal feeling being in a match that we were favourites for instead of the lively outsiders, and you could see exactly why we were favorites by the intensity of the pre-match warm-up that the Donegal players went through. A striking feature of it was a drill involving a long kick pass to an oncoming player running at pace. The game started brightly for Donegal, and looked very dangerous from the off. The direct ball into Michael Murphy was immediately employed, and all the play was coming through Karl Lacey on the right wing. Mayo were well organised and looked bright as well, but a well constructed Mayo advance was intercepted by Neill McGee and Lacey was fed again. The pass into Michael Murphy was as dangerous as it was direct. He turned and shot in a movement that seemed to be a drill from training. One thing that the video does not pick up is the power of the shot, as the footage was shot directly behind the flight of the ball. It was a pity that it wasn’t scored in the last minute rather than the first three. It definitely set up the winning of the game for us. Email “I shot that! The stories behind your favourite YouTube clips: Murphy’s magic moment”. Feedback on “I shot that! The stories behind your favourite YouTube clips: Murphy’s magic moment”.